The best, most luxurious and well located New York style loft anywhere in the city! Stepping inside this one of a kind luxury, custom designed loft apartment the first thing you will notice is the exceptional attention to detail that has gone into every facet of the renovation and interior design. 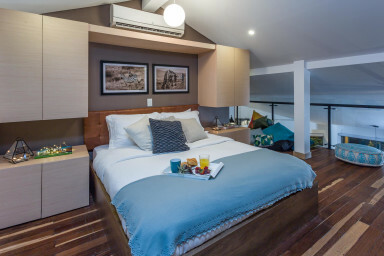 No expense has been spared to bring you the most unique, comfortable and luxurious experience you can find in Medellin. Immediately you will notice the unique green, floor to ceiling view of the bamboo forest across the road and you will be lulled into a deep sense of relaxation and comfort as you unwind from a long journey. There’s nothing more comforting after a long trip than arriving at a place that already feels like home; or something much, much better. Begin your Medellin experience by stepping out onto the small balcony to let in some fresh air, listen to the sound of the creek and take in the beautiful Provenza neighborhood. You’ll more than likely smell coffee and pastries from the plethora of ‘al fresco’ eateries on the street below. Sit yourself down on the luxurious leather sofa and put your feet up, or pull up a chair to the work desk and connect to the high speed Internet to catch up on those emails. Either way, you’ll be impressed with the level comfort, style and sophistication that this apartment provides. Climb the stairs to the mezzanine level and you’ll find that the queen bed isn’t bad either, with a custom made base for extra strength, superior quality pillow-top mattress and the finest quality linen. You’re in for a real thrill whether you getting a good night’s sleep or getting romantic with your significant other. Not that you’ll want to watch TV with some many things to do right out your front door, but just in case we fitted the apartment with the latest flat screen TV’s both in the living room and in the bedroom with a blue-ray player downstairs for those nights indoors. Everything we have learned about hosting guests in our eight years of business providing the ultimate experience to visitors to Medellin has been accumulated, redefined, improved and delivered into this building. But we haven’t forgotten the basics. You’ll still get the fastest Internet available at 15 megabytes download speed through fiber optic cables and a digital safe for your valuables. All of our guests also have exclusive access to our one-stop-shop travel and business center for co-working, trip planning, and social networking. We are available 24/7 for any inquiries or questions you might have and the apartment contains a comprehensive guidebook with information of what to do and where to go in Medellin. And that’s not all. Right out of the front door you’ll be bewildered with choices on which boutique deli to buy your morning breakfast or which trendy coffee shop to get your daily fix. The Provenza area is lined with restaurants, bars, cafes and shopping but the center of it all, the best location of all, right in front of the Éxito convenience store is your vacation rental. There is literally no better location in the city. And, if you think there has to be a catch, there isn’t. The Bosques de Provenza bulding is located on one of the quietest streets in the area with a bubbling brook and bamboo forest right across the road. So, there’s really nothing left to stop you from experiencing the best holiday rental experience you will ever find in Medellin. Let’s create some life long memories starting today, book now! Poblado is the tourist center of Medellin with all the best nightlife, shopping and facilities for the visitor. Some of the most popular areas include Parque Lleras, and the Zona Rosa along with the main avenue that has some of the biggest and best shopping centers including San Fernando Plaza, Oviedo Mall and Santa Fe. The apartment is walking distance to almost everything you'll want to do while you're here and for the other locations, taxi's are easy to call and are metered so you don't have to worry about overpaying. The metro station is a 20 minute walk down the hill.